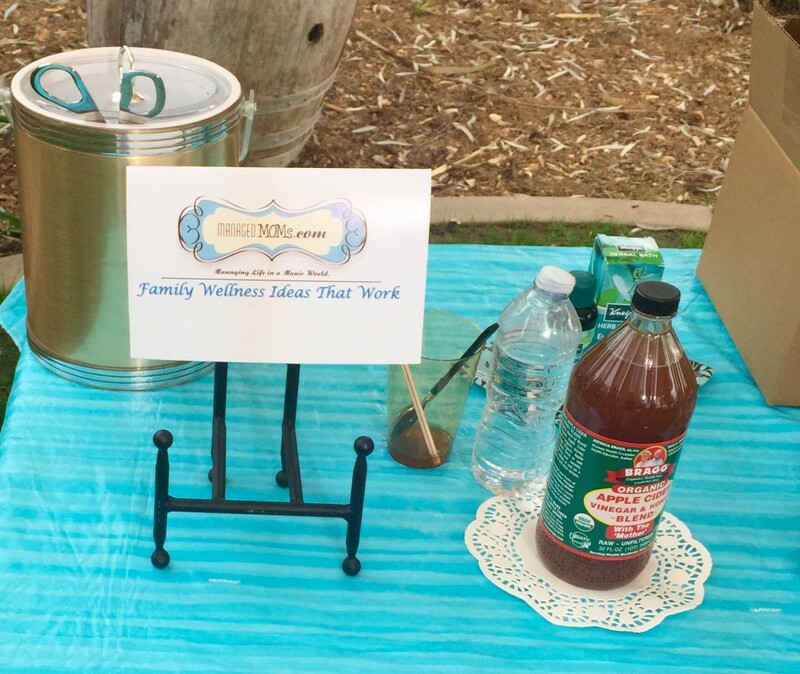 You are here: Home / Family Matters / Family Wellness Ideas That Have Been Working For Us! 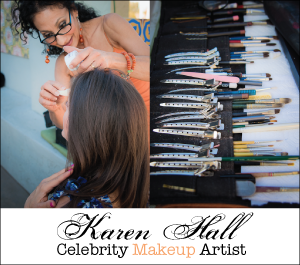 From my KTVK Channel 3 segment on the “Your Life A to Z” show that aired today…. The main reason I blog is to share ideas on how to make our manic lives a bit more managed and when I find natural remedies that work, I get really excited and I can’t wait to share on this blog! *Allergies – Boy have allergies become a big issue in our desert. It didn’t used to be this way and it is believed that a big reason is because so many people discovered our beautiful Valley of the Sun, moved here and planted their favorite flowers and plants from back home. Whatever the reason, I have been a big allergy sufferer to the point where my runny nose and sneezing would wake my husband. He asked me to try to figure out my allergy relief plan, for both of us. We also have four cats so that contributes a bit, but testing proved that most of my allergies are plant related and food related. I cleaned up my diet first and foremost with a lot less sugar and bread and that made a huge difference for sure. Two more changes followed. First getting rid of our carpet and I mean a lot of it! We recently installed beautiful hardwood floors and things are better for sure. 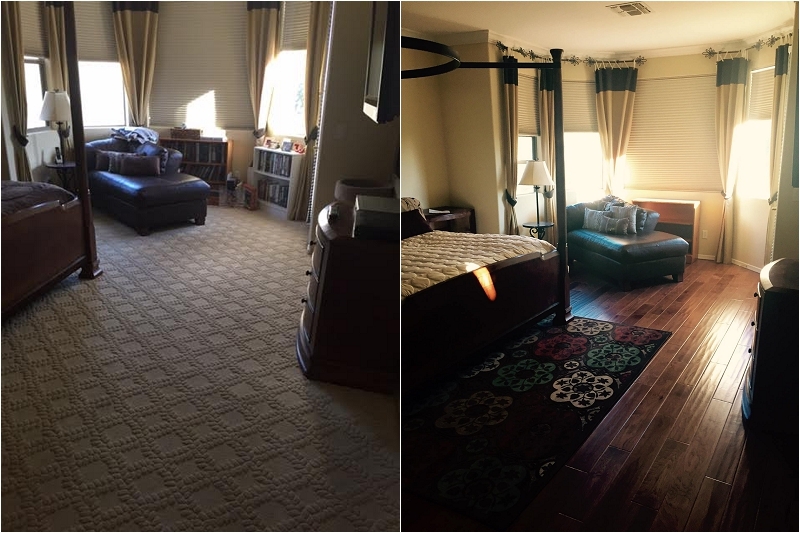 We hired Excalibur Hardwood Floors and the difference is both visually beautiful and physically appreciated with less allergy problems! Carpet traps and holds dust, pet dander and more so it makes sense that wood or tile floors would help with allergies. And just look at how much better and cleaner our bedroom looks! Love this…. I also started drinking a little concoction that our show’s makeup artist, Karen Hall told me about and she looks and feels amazing. She doesn’t even begin to look her age, which is somewhere in her 60s. So I always put a lot of stock in her recommendations. She told me to try apple cider vinegar mixed with honey. I was thrilled to find that Bragg’s Apple Cider Vinegar With A Honey Blend (this is how it appears on the label) is sold at Sprouts Farmers Market. Every day I mix about 1 1/2 tablespoons of the vinegar with 8 oz of water. It tastes like apple juice and I have been amazed with the results. Since I started drinking this twice a day, my allergies have disappeared. I have been off Claritin for over three months now. I have also avoided any sinus issues thus far that I almost always have every year. I am hopeful that this will carry me through Spring, when our allergy season kicks in to high gear. I will report back on my blog if it does and for now I am thrilled with this natural remedy! Definitely try incorporating the Bragg’s Apple Cider Vinegar with Honey Blend into your diet if you are an allergy sufferer. Be sure to dilute it with a lot of water since the acidity can damage tooth enamel. Drinking it straight is not recommended. As always, whenever trying any new remedy, double check the ingredients with your doctor to make sure that an ingredient isn’t present that may interfere with a current medical condition. *Sinus Issues – For the last several years now, I take a special bath at the first sign of sinus pressure and this remedy has worked wonders. 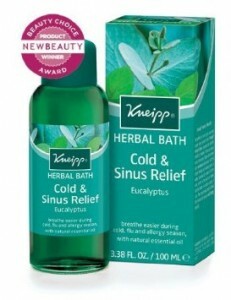 I put a capful of Kneipp Eucalyptus Sinus Relief Herbal Bath in a hot bath under the running water and soak for about 15 minutes. It works wonders and really helps to open and relieve my sinus pressure. I buy mine on Amazon for around $15 a bottle and it is worth every cent. 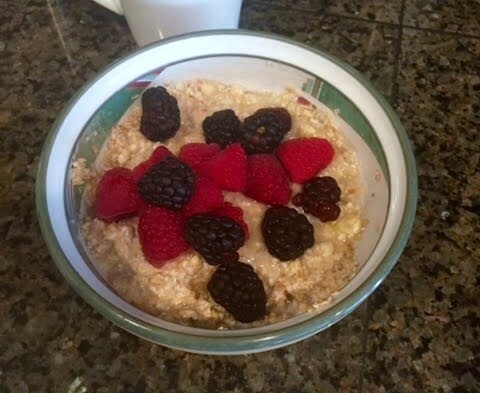 *Quick & Healthy Breakfast Idea – I found a terrific instant oatmeal that I approve of and like, but it isn’t sweet enough alone for my family, so I experimented with three simple ingredients to sweeten it myself. My family loves it and I feel good about providing this super quick, tasty and healthy breakfast to everyone before we all head out to another crazy busy day. 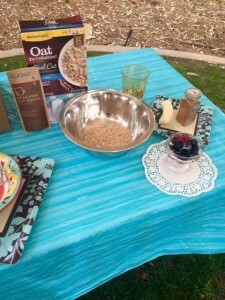 I use the Better Oats Oat Revolution Steel Cut Instant Oatmeal with Flax brand. I recently noticed this brand the last time I was at my grocery store, so I bought it to give it a try. I love that the packets are filled with ingredients that only include steel cut oats, flaxseed and salt, with no added sugar, so each packet only contains 1 gram of sugar. Compare this to many other brands and you get 9 grams of sugar and a bunch of ingredients that I can’t pronounce. No thanks. So here is the 2 step prep that I do to naturally sweeten it. These steps are kid and teenager approved…. Step 1 – Simply boil water or heat milk, if you choose to use milk. The handy oatmeal packet has a measuring water line so you know the exact amount to add to your oatmeal. However, I just eye the amount of water or milk. I think almond milk would be so tasty to add to this, but my daughter is allergic to tree nuts, so I use water. 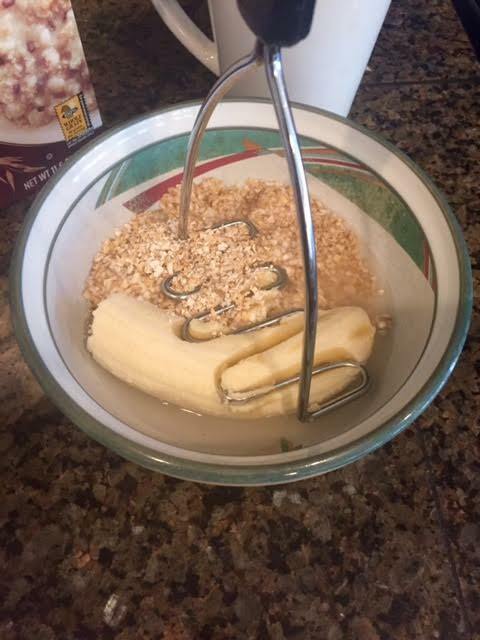 Step 2 – Add 1/2 a banana and mash into oats and water. Top with cinnamon and you have delish and healthy oatmeal that was made in under 3 minutes and is kid approved! 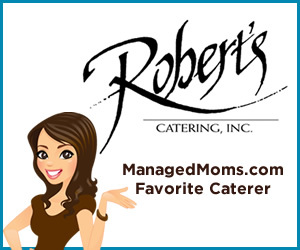 *Farm Fresh Local Foods for Dinner – I just love when I find healthy new tips for families, especially when it comes to cooking nutritious and tasty dinners. I am SO excited to tell you about the new meal kits that I have been receiving that come from a local and organic farm! Sunizona Family Farms now ships dinner kits that contain everything you need to make a healthy, organic and tasty meal. Plus I have been trying to prepare and eat more plant based meals and this service makes it easy and tasty, which I am thrilled about. One of my favorite Meal Kits from this farm contained organic whole food ingredients to make yummy veggie Queso nachos that actually used eggplant, garlic, seasoning, red bell pepper and other surprising ingredients to create nachos that tasted hearty and fantastic! Wondering how this works? It is super easy! Every Tuesday, I go to my favorite local healthy cafe, Pomegranate Cafe to pick up my weekly Sunizona Family Farms Flavor Crate which is filled with the organic and fresh produce and foods that I ordered online over the weekend. Recently Sunizona Family Farms added the Mealkits. 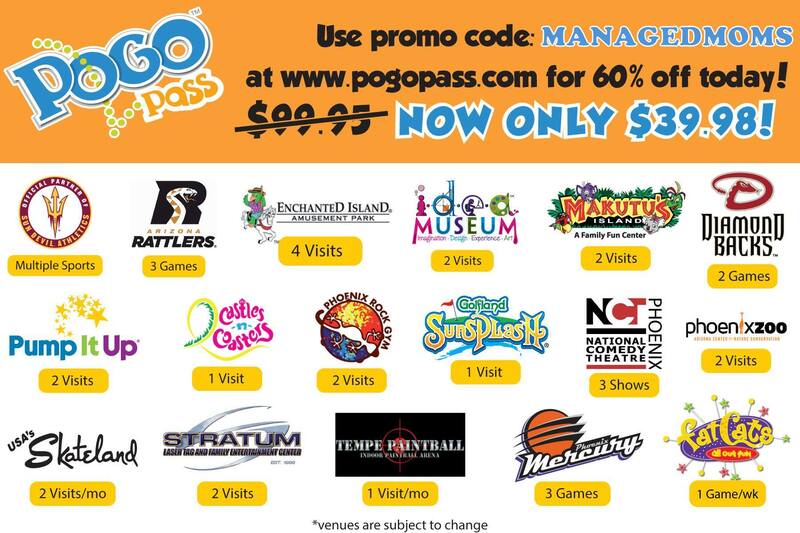 I preorder over the weekend and pay online. Each Meal Kit costs $22 with a subscription option available. For that very fair price, I receive a box packed with every fresh whole food ingredient needed to make a meal and a side dish, which may be a salad and sometimes a healthy dessert, too. Some of the other Meal Kit recipes I have made, that my family loved, include the Minestrone Soup which also came with items to make a nice tossed side salad and yummy whole grain garlic bread. *Dry Skin – With our temps warming up again and our super dry climate, dry skin continues to be a problem for a lot of us. Our triple crown plan has been coconut oil, oatmeal baths and a product with a funny name called Toe Juice. Coconut oil just rocks because it can be used for all types of issues from head to toe. I cook with it a lot and I always dab a little on my lips, nails and hands. I do a lot of hand washing and my hands always start to get little eczema spots, so I have been able to stop the rash in its tracks with pure organic virgin coconut oil. I also make sure to apply hand cream nightly before I go to bed. Oatmeal bath – Sometimes eczema develops on my daughter, around her legs and arms. It is definitely getting better as she grows up and she is now 14, but when she does get a flare up, she immediately takes an oatmeal bath with Aveeno Oatmeal packets that we get at the drug store. This has helped a lot. Toe Juice – I discovered this product a few years ago and I love it for all over skin issues, especially for my dry heels that are back again now that flip flop season has returned. Toe Juice with DermaVine was developed by a high school chemistry teacher for his infant son’s split, cracked feet. Doctors and pharmacists didn’t have a solution that worked, so he used a combination of well-known plant extracts to create the solution. Looking to avoid the messy, greasy issues of available creams, lotions, and salves, he pursued a liquid application. I apply it to my own dry heels and then use a pumice stone to get the cracked dry skin right off for silky smooth heels. When I blogged about this, I had several readers to tell me that it worked wonders for their skin issues, too! Toe Juice can be purchased at www.toejuice.com. 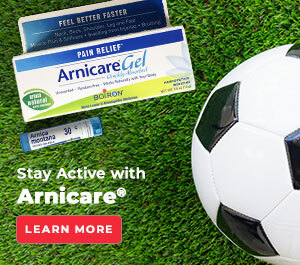 *Use Boiron Arnicare Arnica Gel to reduce bruising and inflammation following a foot injury. My bruising went away significantly faster every time I remembered to apply this gel that is paraben free, non sticky, unscented and nongreasy. 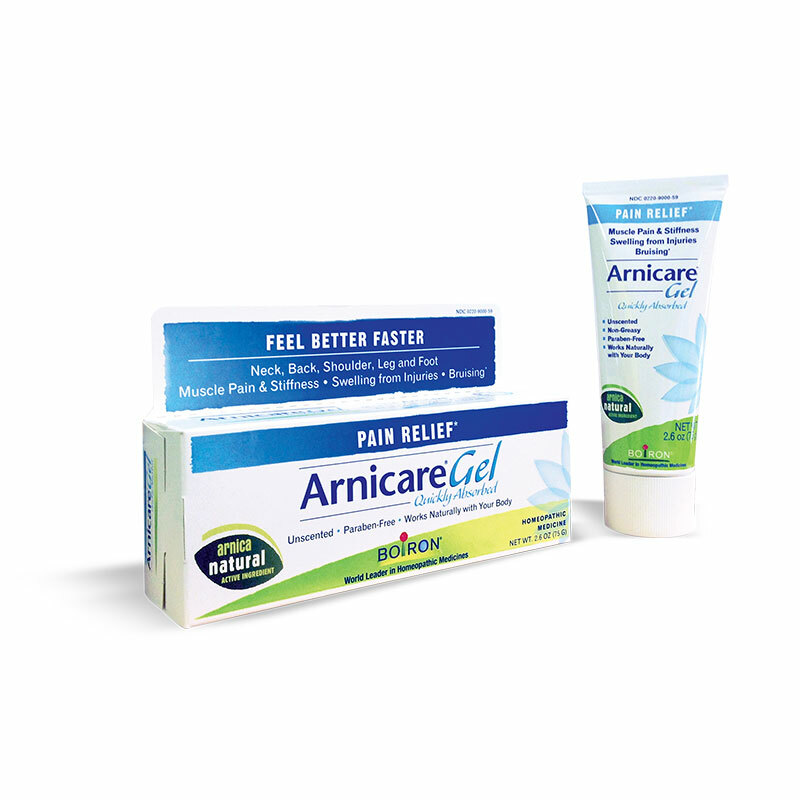 It is a homeopathic ointment that my Mom first told me about and it works great. *My physical therapist sent me to an athletic locally owned shoe store called Sole Sports where the experts on site actually have you run on a treadmill to evaluate your gait to see which shoe best suits your needs. 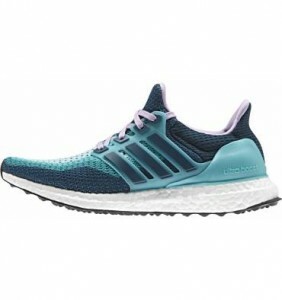 The Adidas Supernova Boost tennis shoe has shortened my recovery time because this shoe gives me the support my fragile foot needs. I paid $129.99 at Sole Sports and it has been worth every penny. Make sure you are in the right shoe for your foot. 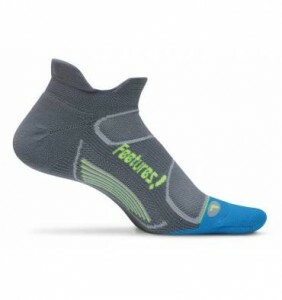 Also look for a good supportive sock like the Feetures brand which provides light padding and arch support and is made with wick moisture fibers to keep feet dry and odor free. 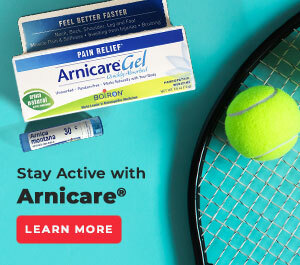 *Before trying the cortisone shot, ask your podiatrist about the alternative natural treatments that we did with ultrasound and more. It is worth trying that first and it worked for me. *Wear better high heels. I have actually found orthotic heels that are stylish and supportive enough that I can still wear heels to events that require me to be on my feet for an extended amount of time, like a wedding, for example. The line that I love and has been interesting to my readers is the Ziera line. I purchase my orthotic high heels from Foot Solutions. What are your wellness ideas? Share here in the comments section because we love to share tips to help all of our make our manic lives a little more managed….and healthy, too! thanks for the information. I’ll be looking for the Better Oats Revolution Steel Cut instant oatmeal. (No sugar–that was a revelation!) I may have to find it on line, but will be using that product soon. Thanks! It does have 1 gram of sugar in each packet, but that isn’t bad and I love that the oatmeal only has 3 ingredients, which include steel cut oats, flax seed and salt. Love that!